The tiny tinsel town Dalhousie tucked away in the lap of Himachal Pradesh is a piece of paradise for all the travellers. It boasts of old world charm, mesmerising natural landscape, pine-clad valleys, flower bedecked meadows, fast flowing rivers, magnificent misty mountains and some of the most spectacular views in the world. The air smells of the Scottish and Victorian architecture and the ambience reminds you of the pristine British flavours. Dalhousie, one of the favourite among most tourists travelling to Himanchal Pradesh is famously known for its mesmerizing natural beauty and its old world charm. This hill station was one of the most favourite summer destinations of the ruling Britishers and this is truly reflected in the majestic Victorian style mansions in this region. Situated far from the buzzing cities in the country, this quaint town transports you to a pollution-free environment in the lap of nature. Dalhousie is known for its scenic beauty has a number mountains and river streams that tourists must visit. Among them the most famous are Panch Pulla, Satdhara Falls and the Daikund peak. This small town, very nearby to Dalhousie is also known as the 'Mini Switzerland' or the 'Switzerland of India'. The mesmerizing beauty of this place has greatly influenced and inspired many kingdoms throughout the years, including the Rajputs and Mughals. Located at an altitude of 6,500 feet, the natural beauty and picturesque landscape of this place are bound to leave an everlasting impression on a tourist. Khajjiar is known for its nine-hole golf-course which is nestled in the midst of lush greenery and a breathtaking landscape. 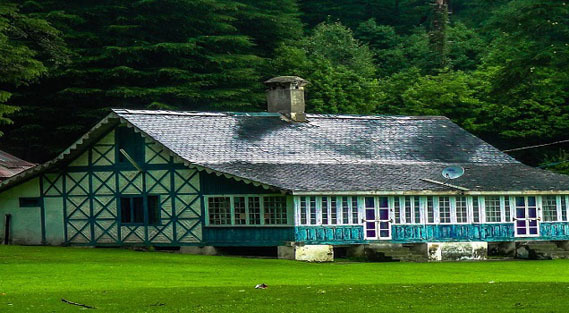 Khajjiar is a plateau with a small lake which tends to be a favorite amongst tourists. This region also attracts adventure seekers and has a lot of options in adventure sports like zorbing, trekking etc. Panch pulla means five bridges. Surrounded by a cover of fresh, green pine and deodar trees, Panchpulla is a waterfall, where five streams come together. Of this, the main stream supplies water to the various cities of Dalhousie. This stream originates from the northern side of Dain Kund. The several streams connecting Panch pulla make this spot a sight for the sore eyes. This place is best known for trekking and its marvellous beauty. A Samadhi (monument) is built here in the memory of a great revolutionary, Sardar Ajit Singh (Uncle of Martyr Bhagat Singh), who breathed his last here. Moreover, the pristine water is best enjoyed during monsoon when the water gushes down the falls and the surroundings leave you stupefied. Satdhara means seven springs. The Satdhara Falls gets its name from being the waterfall that brings together the waters of the seven beautiful springs. This stunning place is situated in the Chamba valley, surrounded by fantastic views of snow-covered ranges, and fresh, green pine and deodar trees. The waters in these springs meet at a point 2036 meters above the sea and dive magnanimously in unison. This is the perfect place for people in search of some tranquillity in their hectic life. The water here is said to contain mica, which has medicinal properties to cure skin diseases. It is known as 'Gandhak' in the local language. The water here is clear crystal and serene. The water gurgles with joy as little droplets of water bounce off the rocks onto us. The pleasant fragrance of wet mud, petrichor, fills the air with a refreshing scent as the water pours into a sparkling and smooth pool of aquamarine water. The sweet nougat smell of flower washes over you and the sun smiles as it peeks through the tall dense trees. The view of the white water surging and plunging from the height hypnotises you with its beauty. The sound of the crashing water is loud but pleasant; it is noisy but in a satisfying way. The edges of the fall hemmed with silver lines glisten in the sunshine. The gigantic waterspout looks as if it belongs, as though the flow of the stream is meant to be cut off to birth this beautiful phenomenon. The backdrop of these mesmerising Satdhara Falls is lush green landscape, sky-touching trees and fog tinted hills; multiplying the beauty of the waterfall. The pine and deodar trees packed densely together for miles making the landscape look like a thick olive green blanket, and the smooth bumps of the hills looking like snow covered waves of perfection; the view that surrounds the Satdhara Falls surrounds the onlooker with its magnificence too. Thick deodar foliage, a plethora of wildlife, snowcapped mountains, carpets of verdant grasslands and easy on the eye streams of fresh water make up the Kalatop Wildlife Sanctuary. Popularly called the Kalatop Khajjiar Sanctuary, it is located in the picturesque hilly Chambal district of Himachal Pradesh. The name Kalatop means 'black cap', which probably refers to the thick black forest cover on the highest hilltop in the sanctuary. Situated few kilometres away from the Chamba dam and Chamera reservoir on the river Ravi, it is known to be rich in flora and fauna. Hundreds of small streams of freshwater empty themselves into the Ravi river to the north of the sanctuary. Kalatop Wildlife Sanctuary is the perfect weekend getaway destination, with very few other places coming close to its natural charm. Animals like the Himalayan black bear, Himalayan black marten, mountain cats, leopard, jackal and langur are the inhabitants of the 30.62 square kilometre sanctuary. There are also 120 different species of birds such as the Himalayan Monal, Eurasian jay, Asian koala, khalij pheasant etc. The well laid out trekking and hiking trails offer a pristine, mesmerizing experience with nature and are arguably the best means to explore the beautiful untouched forests of the park area. The proximity to the splendid hill station of Dalhousie makes it an adventurer and nature lover's paradise, surrounded by majestic hills, snowcapped mountains and thick forests. Views of the towering and immaculate Pir Panjal range from Kalatop resthouse is a breathtaking sight to immerse yourself in. The wildlife sanctuary is present in between Dalhousie and Chamba with the flora and vegetation here mostly comprising of fir, deodar and blue pine due to its high altitude (varying between 1185 meters to 2768 meters) and Himalayan terrain. The countryside landscape is sure to provide you with a sense of astonishment and wonder. Over the years, it has gained popularity as an extremely scenic picnic spot and a great place for trekking and nature walks. This is the highest peak in the area watching over the beautiful pine laid landscapes of Dalhousie. It is situated 10 kms away from Dalhousie at a great height of 2755 m above sea level. One can get a panoramic view of the hills and rivers below from here. This is also known as the Singing Hill wind blowing through the trees create a musical serenade. Named after the famous freedom fighter Subhash Chandra Bose, this is a perennial spring which has medicinal properties and believed to have cured the freedom fighter of his ill health. Located 1 km away from Gandhi Chowk, this tribute to the leader is an ideal spot for picnics and evening strolls. Situated near these springs is a beautiful waterfall which flows into a glacial stream. This is the highest area in Dalhousie and is circled by a road called Bakrota walk which leads to Khajjar. With a handful of estates here, the area does not have too much to attract tourists but is ideal for strolls and to look around and enjoy the sceneries. The area is surrounded with deodar trees and hills all around. This medieval town, just a little away from Dalhousie, is set against the beautiful backdrop of stunning hills and a flowing pristine river and has an alluring charm pertaining to the mystical temples and the local folklore. Chamba also houses a popular museum, the Bhuri Singh Museum, where one can find a number of paintings, inscriptions and much of what the history of Chamba rulers left behind. One may also visit the Rang Mahal or old palace in the district which houses the Himachal emporium. The emporium sells a number of local specialties such as shawls, chappels etc. The emporium is open all days of the week except Sunday, 10:00 AM-5:00PM, with a one hour break in the afternoon from 1:00 PM-2:00 PM. Away from the chaos of city life, lies a small town of Dalhousie. The attractive hill station is located in the Chamba district of Himachal Pradesh, India. Earlier a part of Punjab, Dalhousie is spread on five Himalayas at an elevation of around 2000 metres above the sea level. A paradise for nature lovers and adventure enthusiasts, Dalhousie is particularly famous amongst trek-lovers. The hill station is a dream come true for trekking fiends as it offers the best trekking trails for beginners. As you pass through the verdant surroundings, you can't resist yourself from soaking in the tranquillity and calmness of the place. There are dense forests of Deodar, pine and fir trees which look extremely quaint. For trekkers who want to trek in the snow, Dalhousie is the best place. The snow-covered mountains and landscapes enhance the beauty and make the trek even more exciting. On the way, you will also find a sanctuary located between Kalatop and Khajjar. Balck bear, jackal and leopards are some of the common animals found here. It is a delight for bird-watchers too. The highest peak of the hill station, Drakund gives you the most picturesque views. Other attractions that you will pass through are Chowari Jot, Khajjar and Kalatop. Khajjar is so beautiful that it is called as the 'Mini Switzerland'. The lush fields, the variety of flora and fauna, myriad colourful valleys and stillness makes Dalhousie a perfect destination for trekking. The bustling and vibrant street of Gandhi Chowk is known as the lifeline of Dalhousie. If you want to buy unique handicrafts and experience local talent, then Gandhi Chowk in Dalhousie is the place for you. Also known as GPO, this place is filled with various markets and shops; ranging from The Tibetan Market, the Himachal Handloom Industry Emporium, Himachal Handloom and Crafts Centre and Tibetan Handicrafts Centre. There is a plethora of various small shops to fulfill your list of gift items. All the major buildings and hotels are situated here, at GPO. The Tibetan market is a popular spot, which offers a variety of goods including bags, dolls, carpets, purses and handicrafts. The Himachal Handloom Industry Emporium on Thandi sarak is known for its traditional Kashmiri shawls; which reflects the intricate craftsmanship of the locals. These handicrafts are unique in their own way. Bhuttico was established by local women in the mid 19th century. It offers a wide range of the famous Kullu shawls; made from lamb's wool, angora, pashmina. Recently, they have also started making the popular embroidered shawls. The costs for these exquisite articles start from INR 300 only.